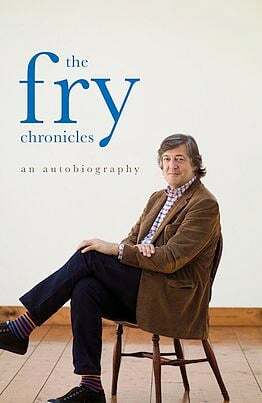 Many times while reading The Fry Chronicles, Stephen Fry‘s bestselling memoir, I was forced to confront sadly the likelihood that the world will no longer need my autobiography. Not that he and I have lived the same life exactly. I haven’t written a dozen bestselling books or had a show on Broadway or been nominated for a Golden Globe or made a series of award-winning documentaries or presented a fantastically popular gameshow — or even published eighteen and a half thousand tweets, though at least I can realistically aim to. Nevertheless, I found myself so wholeheartedly agreeing with so many of his observations on life that anything I might have to say is now effectively redundant. We even share a passion for Ricicles. ‘I saw you in Nightcap you were magnificent it was brilliant,’ I said in a rush. The excruciating horror of mutual appreciation out of the way, we both paused, unsure of how to continue. Five minutes later Hugh and I were writing a scene together as if we had been doing it all our lives. You read about people falling suddenly in love, about romantic thunderbolts that go with clashing cymbals, high quivering strings and resounding chords and you read about eyes that meet across the room to the thudding twang of Cupid’s bow, but it is less often that you read about collaborative love at first sight, about people who instantly discover that they were born to work together or born to be natural and perfect friends. Nobody seems to expect me to be shy, or believes me when I say that I am. I cannot blame them. I seem to move with such ease through the world. […] That is how people like to see me, be the truth never so at variance. It may be the case that I am a Jewish mongrel with an addictive self-destructive streak that is has taken me years to master. It may be the case that my afflictions of mood and temperament cause me to be occasionally suicidal in outlook and can frequently leave me in despair and eaten up with self-hatred and self-disgust. It may be the case that I am chronically overmastered by a sense of failure, underachievement and a terrible knowledge that I have betrayed, abused or neglected the talents that nature bestowed upon me. It may be the case that I doubt I will ever have the capacity to be happy. It may be the case that I fear for my sanity, my moral centre and my very future. All these cases may be protested, and I can assert their truth as often as I like, but the repetition will not alter my ‘image’ by one pixel. Stephen Fry’s public revelation that he suffers from a form of manic depression and the Emmy Award-winning two-part documentary on the subject that he subsequently made (Part I and Part II) have revolutionised the understanding of mental illness in the UK. Now the president of mental-health charity Mind, Fry continues the hugely valuable work of awareness-raising through public activism and his writing. Although the events of The Fry Chronicles predate his diagnosis, the book is coloured by his interpretation, through the lens of his bipolarity, of his own behaviour (Cs again) — the credit cards, the cars, the country house, and, in the final page, a prelude of what’s to come in the next volume of the chronicles, cocaine. Between now and such a volume, though, lies Stephen Fry’s guest appearance at the House of SpeakEasy. You can buy tickets for our March 18 show, “Are You For Sale?”, which also features Susan Cheever, Michael Friedman, Jay McInerney and Jeff Kinney, on the City Winery website here.